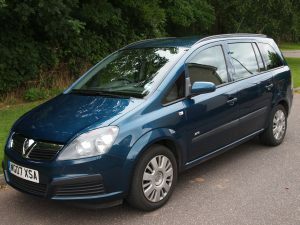 Description of car for sale : Vauxhall 2007 O7 Zafira Manual petrol Peacock Blue £3,500 107,000 miles, "In Good Condition. Excellent Family Car, Large Boot Space. Converts Into 7 Seater. 1.6 Litre. 1 Previous Owner. Full Vauxhall Service History (Last Service May 12).5 Door Estate, Peacock Blue, Petrol, Manual, MOT & Taxed"